The world is so constructed that unless we look at what’s happened in the past, we won’t be able to deal with the present. With tension ever mounting in the Korean peninsular, all the higher every year with US bombers conducting annual drills over South Korea within direct strike range of North Korea, it is notable and deeply regrettable the West has lost all sight and memory of the enormous destruction inflicted on the Korean people in the Korean War 1950-53. How can we ever in the West begin to understand the large scale militarisation of North Korea if, in the US and UK in particular, political assessment and judgement takes no account of Korean history? North Korea was as a matter of historical fact through the Korean war carpet bombed for three years by US bombers. There was, after the first months of the war, mounting air defences in northern most North Korea bordering China, including Russian MIG fighters but, none-the-less, US B29s bombing was for most of the war free-range over the whole peninsular. “The US airforce destroyed every town and village in north Korea”. “The destruction was enormous”. “We burned down every town in North Korea …. over a period of three years or so we killed – what – 20 percent of the population”. “We did a lot of napalm work dropping fuel tanks loaded with napalm, flying in low, called a Nape Scrape”. Napalm, jellied petroleum and phosphorus. No-one likes to spell it out but people quite simply burn to death. 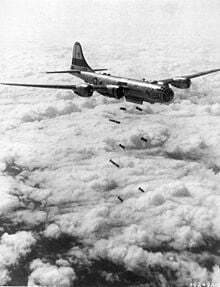 In all some 600,000 tons of bombs were dropped on the towns and villages and cities of the country. That is well over a million concussion bombs, along with 40 million gallons of high octane napalm. And to add to this, in the final stages of the war, mass bombing (1,514 sorties) of Sui-ho hydro-electric and irrigation dams (the world’s fourth largest) on the Yalu River then flooding and destroying huge areas of northern farmland and crops. “The physical destruction and loss of life on both sides was almost beyond comprehension, but the North suffered the greater damage, due to American saturation bombing and the scorched-earth policy of the retreating UN forces”. That then is the horror of the brutal Korean war. 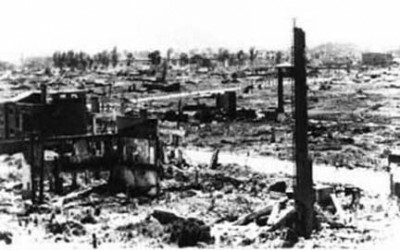 Over two million Korean civilians died including many tens of thousands of children. On US pilot testament destruction was “indiscriminate”. Is it then any wonder North Korea turns out a highly militarised state, deeply loathing the “Yankees”, raining bombs and death and destruction on their towns and villages for three years ? No-one can deny the one-party state authoritarianism of North Korea but then we surely have to ask how much of this huge militarisation has been created by the horrors of warfare, all the more so large scale bombing impacting on civilian populations. As also not to forget, until the end of WW2, Korea suffered 35 long years of brutal occupation by the Japanese. Over one million forced deportations, suppression of Korean culture and identity, deaths in Japanese labour camps estimated at over half a million. In all Korea was a long suffering country for many decades, the very worst not forgotten by the Koreans the enormous destructive US bombing ’50-53. International Perspective – East or West trauma is not forgotten. The US, and New York in particular, were devastated by the attack on the Trade Centre towers in 2001. Terrible shock traumatic destruction with 2,996 deaths and 6,000 injuries. And that huge and deep trauma living on to this day and for whole lifetimes in those directly affected, all who lived and live in New York, and indeed in the consciousness of the whole of the US, and the world. But the West forgets and is oblivous or indifferent to the suffering inflicted on the Korean people 1950-53. And that is bombing and destruction and loss of life of many thousands of Trade Centre attacks. Not loss of life from air attacks on armies in combat but bombing of civilian populations in towns and cities to “terrorise” a country into submission. That was, on all the evidence, in the face of huge Chinese troop influx into the peninsular, US military policy. It is then impossible to see how it could be clearer, for those who will look, the actions of the US and West have played a hugely determinate role in the creation of the deeply alarming militarised state of Korea the West not only condemns but has listed (George W. Bush 2002) as part of an “Axis of Evil”. On this view not a breath of recognition that three years of carpet bombing, following 35 years of repression under Japanese occupation, surely provides an understandable rationale why any country would become formidably militarised. Defence of the country the all-consuming priority. For the people of North Korea the mass killing and destruction of civilians a holocaust against their people. For them, United States enormous war crimes and atrocities never brought to any court of justice. Instead the hugely admired US East Asia commanding general of the time, General Douglas MacArthur, returned home in 1951 to a huge New York ticker-tape heroes welcome. Not condemnation from the US public (as arose in the Vietnam war) but celebration. But then the general US public of that time new very little of the real consequences of the war on the country. For instance that MacArthur and many in higher US military circles advocated dropping atomic bombs on Chinese cities to get the war over and unite Korea. History Repeating – self same military mind-sets gathering again. And now we have history on the brink of repeating yet again. The whole situation enormously high risk and dangerous with Secretary of State Tillerson indicating in his view, as he did in discussion April 12th with Russian Foreign Minister Lavrov over Crimea and Syria, “history is not the issue”. What matters, as Tillerson said, is dealing with “current threats”. In a stroke Mr Tillerson excluding all relevance of historical causes and motivations why North Korea is so vehemently anti-American. Since then the Secretary of State has made clear, in the UN Security Council 28th April, “the time for strategic patience is over”. And all the more deeply alarming telling the Council there will be “no negotiations” until North Korea “first” takes “concrete steps” to shut down all missile activity and “de-nuclearise”. For Tillerson, and UK Foreign Secretary Johnson, in considerable contrast to the views of China and Russia, the reasons why North Korea has become one of the most militarised states in the world are not relevant. The Korean War with 3 million dead not counted in contemporary political calculus. And so it is the West makes no effort to understand another nation’s history then history repeats. But then in the US and in the UK the Korean war is known as the Forgotten War. Forgotten for one reason as in burying memory of large scale war crimes against civilian populations. Horror for civilian population, horror for combatant troops. The West in so many ways in denial of a war that is very distant “long ago” but then, for the Koreans, as alive today as terror and fear of the US and West as sixty years ago. And from the side of the West, to face up to responsibility for the huge numbers of civilian casualties from bombing of Korean towns and cities as US governments would, as at Nuremberg, face the self same charges the West brought against the Nazi regime after WW2: Crimes against Humanity. War crimes against civilian populations. Understanding the other side – understanding ourselves. Such Human Rights courts of justice not on any agenda anywhere in the West a very good start to ease tension would be, as is being called for by China and Russia, high level meetings between all major parties. And in this respect, at the heart of the whole current tension, it is of the deepest concern that in the West it is rarely brought to light that the US has repeatedly turned down North Korea offers to end nuclear weapon development. These offers rejected US military build-up as of May 2017 in warfare exercises includes the newly installed US anti-missile THAAD system, low flying bombers within minutes’ strike range of North Korea, together with an aircraft carrier battle fleet, including who knows how many nuclear strike submarines, in Korean off-shore waters. North Korea finds all this US “menace”, as both China and Russia have repeatedly emphasised, hugely threatening (as indeed do the Chinese). And one would think, if it was our own country, terrifying. For UK just compare the 1940 blitz with cities across the UK from London to Liverpool ablaze. British people do not forget. And for the US, missiles on Cuba in the early ’60s and that very nearly leading to world nuclear war. But on the North Korean offers to de-nuclearise the US repeatedly refuses quid pro quo de-escalation with parallel negotiations. On scores for belligerence the US, and others in the West including the UK, could surely not be higher. On four counts : enormous destruction of North Korean civilian population by vastly superior US air forces 1950-53 (albeit bannered under the “UN”) ; repeated US refusal of North Korea’s offers of quid pro quo de-esculation of forces on both sides; US bringing even more over-whelming military force into South Korea and off-shore seas ; US and UK calling for and indeed demanding, through the UN, imposition of more and more powerful sanctions, most crippling closing international access to sources of financial exchange. This then closing off (blockading) routes for trade driving North Korea into deeper isolation and poverty. Threats mounting on both sides, racking up more and more tension and fear. As in all conflicts so much mirroring, of behaviour, both sides then condemning the other. Defence and survival on one side seen by the other as threat and belligerence. In the case of North Korea desperation leading who knows where. The enormous tragedy for Korea – for all Korean people. In all an enormous tragedy for all Koreans. Bitterly and deeply ironically both sides in Korea want to unite, as one Korea. 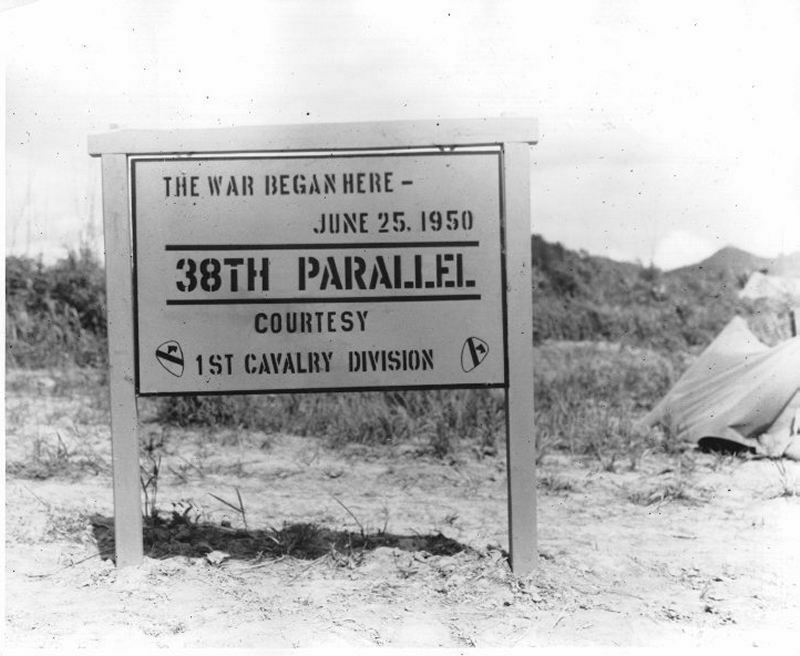 Huge loss of life and huge casualties, three years of war with estimates of over three million dead, both sides fighting to “unite their country”, only to end up summer 1953 exactly where they started on the 38th parallel. Such utter futility. The pity and insanity of war at its most tragic. As matters stand now, with increasingly intense US and South Korean military exercises each year, in the face of ever increasing North Korean nuclear strike capacity, the latest missile launch 14th May getting closer to a full-fledged long range ICBM strike capability, the whole situation is clearly becoming progressively more precarious year by year. High level careful communication is clearly needed, as repeatedly promoted by the Chinese. Not warships and missiles, from either side, ending up mirroring each other into destruction. With tensions ever mounting, it is then encouraging that newly elected South Korean president , President Moon Jae-in, wants to talk with the North. And it is understood wants to see the THAAD missile system removed. And for the North Koreans, from the Western view, however hollow we view their society, however much it appears or indeed is a sham, the people clearly have enormous pride. In so many ways (the great buildings in Pyongyang, military parades, and missiles) showing to the world how much they have achieved, and that is achieved from ground zero 1953 total destruction of their country. And this achievement in huge contest and rivalry, with powerful national jealousies, between North and South. The two sides the great misfortune to end up on the world’s most volatile tectonic plates between communism and capitalism. Both sides showcasing what their “side” has achieved: the South hosts the Olympics and FIFA World Cup, the North parades and launches missiles. This whole complex psychological cauldron is what the West needs to understand and respect. Respect Fuche – self-reliance – the founding ideology of the country. However badly from the West we view the regime, to the country’s credit they have made huge and heroic and enormous progress providing universal education, health care, and housing, for their population. And that is universal and free health care and education up to university level. No massive student debts for North Korean students. No sick and uninsured with no medical health care in this country. Their system has huge holes, as we do in the West, but its not all bad, unless we in the West will only see it that way : esse est percipi – thinking makes it so. There is much we might learn, if we negotiate, not wrack up mounting war menace and threats. Korean War – Part 19 – Use of Napalm … Senator John Glenn – in 1950 a major in US Air Force : “We did a lot of napalm work … dropping fuel tanks loaded with napalm .. we call it a Nape Scrape” “You could strafe them, bomb them, napalm them. Quite a variety of weapons. Korean War – Part 22 – bombing of North Korea .. the United States Air Force destroyed every town and city in Norht Korea. Kim Un Sun – factory worker – “Lets make bullets of revenge to give to the Americans”. North Korea Remembers US War Crimes – what the West wants to forget … the view of North Korea : “Brutal atrocity of US Imperial Aggressors”. Attacks on the Sui-ho Dam … the hydroelectric targets were subjected to attacks totalling 1,514 sorties. Asia-Pacific Journal 2009: Professor Charles Armstrong “Five reservoirs were hit, flooding thousands of acres of farmland, inundating whole towns and laying waste to the essential food source for millions of North Koreans.10 Only emergency assistance from China, the USSR, and other socialist countries prevented widespread famine”. The Destruction and Reconstruction of North Korea – 2009: Professor Charles Armstrong, “The US Air Force estimated that North Korea’s destruction was proportionately greater than that of Japan in the Second World War, where the US had turned 64 major cities to rubble and used the atomic bomb to destroy two others. American planes dropped 635,000 tons of bombs on Korea — that is, essentially on North Korea –including 32,557 tons of napalm”. Arms Control Association – 2015: North Korea announces offer to suspend nuclear testing …in exchange for the United States and South Korea calling off annual joint-military exercises slated for spring 2015. The United States rejects the offer. 12th April 2017 Tillerson Lavrov Press Conference on Syria – Lavrov emphasises “historical context” – Tillerson dismisses history with emphasis on “current threats”. US Dept of State – 12th April 2017 Tillerson Lavrov Transcript: Foreign Ministr Lavrov : “As far as Syria is concerned and Bashar al-Assad, we talked today about the history, and Rex said that he was a new man and is not interested so much in history; he wants to deal with today’s problems. But the world is so constructed that unless we look at what’s happened in the past, we won’t be able to deal with the present”. 28th April 2017 – UN Security Council Meeting on Korea … full meeting. US Dept of State – 28th April 2017 – Secretry Tillerson Statement to UN Security Council: “The policy of strategic patience is over”. Call for economic and financial isolation of DPRK. North Korea must take concrete steps to end illegal weapons programs before we can even consider talks. NY Times – Choe Sang-Hun – 2nd May 2017 – US Antimissile System Goes Live in South Korea …. Global Research 2010 – Professor Michel Chossudovsky: “It is now believed that the population north of the imposed 38th Parallel lost nearly a third its population of 8 – 9 million people during the 37-month long “hot” war, 1950 – 1953.” “US Sources acknowledge 1.55 million civilian deaths in North Korea”. Wikipedia Civilian Casualty Ratio – Korean War: The median total estimated Korean civilian deaths in the Korean War is 2,730,000. March 2015 – Washington Post fomer reporter Blaine Harden: The US war crime North Korea won’t forget – “War reporters rarely mentioned civilian casualties from U.S. carpet-bombing. It is perhaps the most forgotten part of a forgotten war”. “People in the North feel backed into a corner and threatened”. Boundless – World History – Korea under Japanese Rule: The 1910-1945 Japanese occupation of Korea was marked by the suppression of Korean culture and heritage, mass exploitation of the Korean labor, and violent repressions against the Korean independence movement. Vox – Max Fisher August 2015 – Americans have forgotten what we did to North Korea: You can glimpse both the humanitarian and political consequences in an alarmed diplomatic cable that North Korea’s foreign minister sent to the United Nations .. in January 1951 : THE NUMBER OF INHABITANTS OF PYONGYANG KILLED BY BOMB SPLINTERS, BURNT ALIVE AND SUFFOCATED BY SMOKE IS INCALCULABLE, SINCE NO COMPUTATION IS POSSIBLE. SOME FIFTY THOUSAND INHABITANTS REMAIN IN THE CITY, WHICH BEFORE THE WAR HAD A POPULATION OF FIVE HUNDRED THOUSAND. UN DAG Repostory – source of 1951 diplomatic cable: English copy of cable. Jeff Williams – CGFTC Marine Electronics; BA (Philosophy) Sothampton University UK; PGCE post-grad teaching diploma London Uni. Career: marine radio Merchant Navy officer P&O cruise lines; college lecturer UK Merchant Navy college; Off-shore oil industry systems control engineer; Technical Editor consumer electronics industry. Now an independent writer – interests in environment, global politics, monetary system, off-shore tax havens.